Synopsis: After a mysterious, lost night on their honeymoon, a newlywed couple finds themselves dealing with an earlier-than-planned pregnancy. While recording everything for posterity, the husband begins to notice odd behavior in his wife that they initially write off to nerves, but, as the months pass, it becomes evident that the dark changes to her body and mind have a much more sinister origin. By now, anyone who is interested enough has probably seen the viral baby carriage promo video for Devil’s Due (and if you haven’t, look it up – it’s a riot). Like the coffee shop prank video that was done for the remake of Carrie, the Devil’s Due clip unleashes the movie’s set pieces on unsuspecting innocent bystanders with hilarious results. And, like the Carrie prank, the Devil’s Due promo video is more entertaining than the movie it advertises. Devil’s Due is the story of a pair of newlyweds named Zach and Samantha McCall (played by Zach Gilford from “Friday Night Lights” and Allison Miller from “Terra Nova”) who, while honeymooning in Santa Domingo, are taken to a crazy underground nightclub where they get blackout drunk. Weeks later, Sam discovers that she is pregnant, despite having been on the pill. The couple chalks it up as a happy accident, and begin to make all the necessary arrangements in welcoming their impending bundle of joy into the world. However, Sam’s pregnancy is anything but typical; she experiences crippling pain, angry mood swings, and bouts of memory loss. Meanwhile, Zach starts to notice strange people spying on them, taking a vested interest in the couple’s activities. Zach investigates the mystery, hoping to save Sam and his unborn baby before it’s too late. Observant viewers might notice a resemblance between Devil’s Due and Rosemary’s Baby. That’s because Devil’s Due basically is Rosemary’s Baby, only with the twist of being filtered through the point-of-view lens of Zach’s video camera, making it a Paranormal Activity clone as well. The script, written by Lindsay Devlin (In So Many Words), borrows liberally from the Roman Polanski classic, utilizing just about every major plot point. Directors Matt Bettinelli-Olpin and Tyler Gillett (who are half of Radio Silence, the group responsible for one of the more memorable segments of V/H/S; the other two Radio Silence guys serve as executive producers) put their first-person shooter style on the story, but that only makes it look more derivative; the found footage gimmick just means that Devil’s Due is a rip-off of two superior films rather than just one. 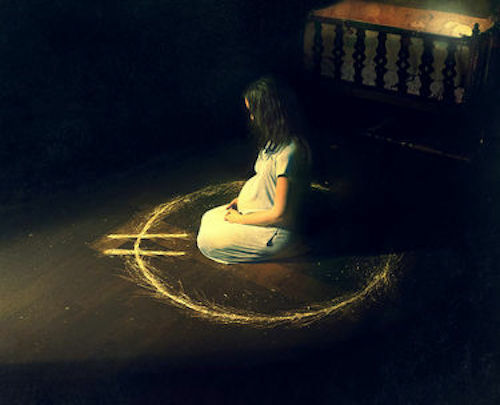 The fact that Devil’s Due is a low-rent Rosemary’s Baby is not its only problem. The narrative is inconsistent and confusing, with plot holes and loose ends everywhere. For example, at one point the McCalls go to see their doctor, only to find that she has been replaced with a different one. It’s clear that strange things are afoot and that the new doctor is in cahoots with whoever has been keeping tabs on the couple, but the incident is never revisited. What should have been a key plot point and valuable piece of exposition is swept under the rug. Devil’s Due is packed with unresolved mysteries, and not in a good way. Found footage films are a tricky business. When done right, they are extremely effective, as evidenced by Paranormal Activity and The Blair Witch Project. When done poorly, they are miserable. Radio Silence proved with their segment of V/H/S that they know how to use the style in a convincing manner, but that knowledge is not put to good use in Devil’s Due. The filmmakers can’t even fall back on the claim that the film is a real documentary because the lead characters are recognizable celebrity faces; they don’t even try to pretend the footage is authentic, thereby defeating the gimmick. Devil’s Due is a prime example of why found footage movies have gotten so tedious and boring. Even though it draws unapologetic influence from two of the scariest movies ever made, Devil’s Due is a pretty tame offering. Audiences have gotten used to the shaky camera work and instant reveals that are trademarks of the found footage genre, so they have to be crafted very skillfully to be effective and, frankly, Devil’s Due just doesn’t do it. There are a handful of creepy images, but nothing that’s really nightmare inducing. The few shocks that the film does contain are results of the sound design, with sudden volume playing more of a role in the scare than anything onscreen, and the feeling is fleeting and not genuine. The tension and suspense that should accompany the viewing of a good horror movie simply aren’t there in Devil’s Due. Put bluntly: it isn’t scary.